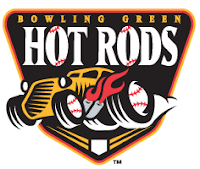 Bowling Green, KY – Ryan Wiegand and Tyler Bortnick each delivered two-out RBI singles for the Hot Rods on Tuesday night, but Bowling Green (33-40) couldn’t muster enough offense in a 4-2 loss to the Lansing Lugnuts (40-34). The loss evens their three-game series with Lansing a one game each heading into the series finale on Thursday night. Lansing’s winning rally came in the top of the ninth in a 2-2 game. Deivis Mavarez, who came on to record the final out of the eighth, struggled with his command by issuing a pair of two out walks. After getting the second out in the inning, Mavarez nearly made it out of the inning before Sean Ochinko belted a two-run double into the left field corner to give Lansing its insurmountable lead. The late offense for Lansing capped off a pitcher’s duel for the first eight frames. Lansing took a 1-0 lead in the first before Wiegand’s single drove in Murrill with two outs to tie the game. In the fifth, Lansing scored on a wild pitch from Kirby Yates to take a 2-1 lead. But, after Murrill reached on a force out, he took second base on a balk and then scored when Bortnick lined a two-out single to left field to knot it back up at 2-2. That was all the offense the Hot Rods could generate, never advancing a runner past first base the rest of the game. Nestor Molina worked two scoreless innings to earn the win and has now thrown 11 scoreless frames against the Hot Rods on the season. Wiegand led the Hot Rods seven hit attack with a pair of base knocks and his 33rd RBI on the season. Gabe Cohen smacked a double and a single while Mark Thomas added his own single to extend his hitting streak to 11 games. Kirby Yates took a no-decision for the Hot Rods after allowing two earned runs over five innings. He surrendered five hits, walked three, and struck out four in his first go-round as a full-time member of the rotation. Matt Stabelfeld had a good night out of the bullpen by throwing 2.2 scoreless on just two hits, a walk, and two K’s. The series now comes to an end on Wednesday night as the first 1,000 fans get a 2010 Hot Rods Team Card Set courtesy of Destiny Dental. For tickets, visit www.bghotrods.com, call 270.901.2121, or head to the Ticket Office at Bowling Green Ballpark. The pitching match-up for Wednesday night features RHP Alexander Colome (4-5, 3.05) going up against Lansing RHP Dave Sever (2-3, 4.15). First pitch is at 7:05 PM. You can listen to the game with Tom Gauthier and Hank Fuerst beginning at 6:50 on 1340 AM WBGN and www.bghotrods.com.